The Medo 45 Air Pump has a linear-motor-driven free piston system has an internal piston inside the cylinder which is driven by an electro-magnet and spring system controlled by the alternating input current cycle. The Medo 45 Air Pumps piston forms a single combined structure of two usually different devices; motor and pump. The Medo 45 Air pump is quiet and vibration free, and offers the advantages of easy maintenance and a long operating life. Medo Air pumps Fewer Components: The Medo Air Pumps unique and simple structure has no complicated transmission mechanism such as a crankshaft, connecting rods, ball bearings, etc., which are widely used in between the motor and compressor in conventional pumps. 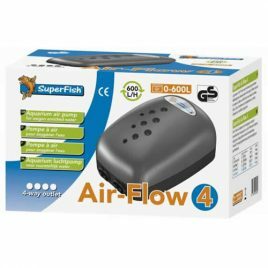 Yamitsu Hi Flow 50 Air Pump All aquarists know that fish require oxygen to live. What is not so obvious is that the bacteria that form part of the biological filtration process also require a good oxygen level to be able to perform correctly and keep your water to the desired quality. It is becoming ever more popular for air pumps to be used to raise oxygen levels in filters. This increases the biomass which in turn enhances the overall performance of the filter resulting in better water quality and healthier fish. 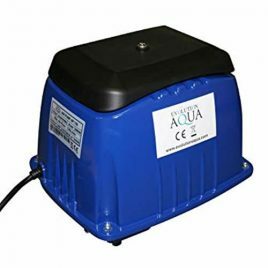 The pump is capable of providing sufficient pressure at an output of 50 litres per minute at a depth of 4 feet. This makes it suitable for ponds and large aquariums. It is supplied complete with two spare diaphragms, two inlet valve assemblies and a high quality chrome manifold with ten individual taps. HAILEA V20 Air Pump The features of V series super silent power air pump that Adopts high quality aluminum alloy to make its case. It adopts double damping system and noise-absorbing system. It is highly efficient ,energy saving,low in noise and safe.Double air chamber structure to produce large quantity of air and strong air pressure.It can work ateadily and continuously. Dimensions: 144 x 290mm (dia x H). Increase in filter performance: to 10%. 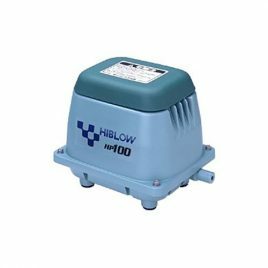 The Hi Blow 100 Air Pump is ideal for delivering large volumes of air under pressure. These popular pumps are designed to drive multiple airstones at depth in your pond or filter chamber. 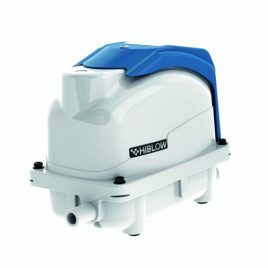 The Hi Blow Air Pump offers a full range of linear diaphragm pumps, including the Hi Blow 100 Air Pump, providing solutions to meet a broad range of requirements in Medical, Industrial, Environmental and Consumer applications. 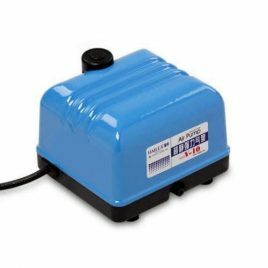 Whenever your requirements call for a pump providing clean oil-less air, extremely quiet operation, long life, low power consumption, low vibration, and low starting current, the Hi Blow 100 Air Pump is the solution. 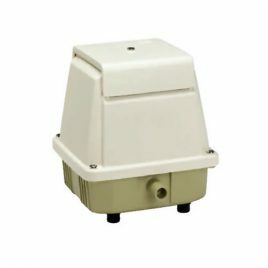 It's advisable to fit one way valves to your air pipes, especially if the Pump is to be placed below the level of the surface of the pond water, as this will prevent any water from siphoning back and damaging the Pump. The Hi Blow 40 Air Pump is ideal for delivering large volumes of air under pressure. 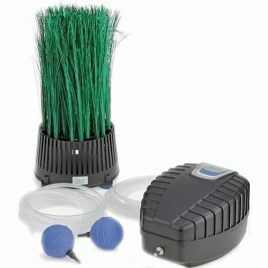 These popular pumps are designed to drive multiple airstones at depth in your pond or filter chamber. 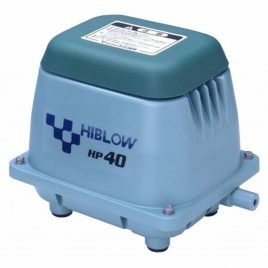 The Hi Blow Air Pump offers a full range of linear diaphragm pumps, including the Hi Blow 40 Air Pump, providing solutions to meet a broad range of requirements in Medical, Industrial, Environmental and Consumer applications. 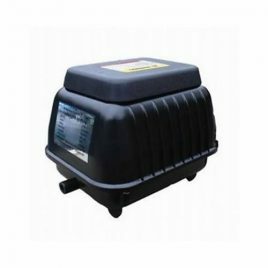 Whenever your requirements call for a pump providing clean oil-less air, extremely quiet operation, long life, low power consumption, low vibration, and low starting current, the Hi Blow 40 Air Pump is the solution. 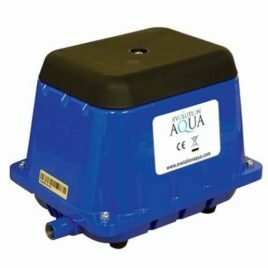 It's advisable to fit one way valves to your air pipes, especially if the Hi Blow 40 Air Pump is to be placed below the level of the surface of the pond water, as this will prevent any water from siphoning back and damaging the Hi Blow 40 Air Pump.